How we order New SIM? Hi friends, we all know about Online Postpaid SIM Connection and there are also lots of people who use Postpaid SIM. Today in this article, we will discuss Airtel, Vodafone, Idea and jio Prepaid Connection or How we Order SIM Online? We all know about that, Jio gives us SIM Home Delivery Service and lots of peoples order jio sim on the official website of jio and order that SIM and as a result of this few peoples get Jio SIM and most of the peoples do not get jio SIM. Now in the current time, if you will order any types of SIM, you will get that SIM in about 2 to 5 hours. No, we do not only get the Jio SIM fast but also get the other SIM like Idea, Vodafone, Airtel because all these services provide very Fast Home Delivery Services. In the Postpaid SIM Connection, first we enjoy the service and after that, we pay the charges. In the Prepaid SIM Connection, first we pay the charges and after that, we enjoy the service. How we Order SIM Online? We always buy SIM offline because we just think that, when we buy SIM offline, we get an Activated SIM. There are also those types of peoples who buy these SIM black and they do not give his/her ID proofs. But Now it is not possible, without any ID proof SIM providers do not give you any SIM because it is not under the policy of an Indian Government. If SIM cards operators do not follow the instruction of an Indian Government then the Government will take a quick action on that SIM Operators. As a result of this, if we want to buy the SIM either offline or online, we always give our ID proofs. Nowadays, the Online method is the best option because in this we just directly fill the details and send to the operator’s official websites. But if you will buy SIM offline, then the SIM operators may be selling a black SIM on your ID and you do not know about this. 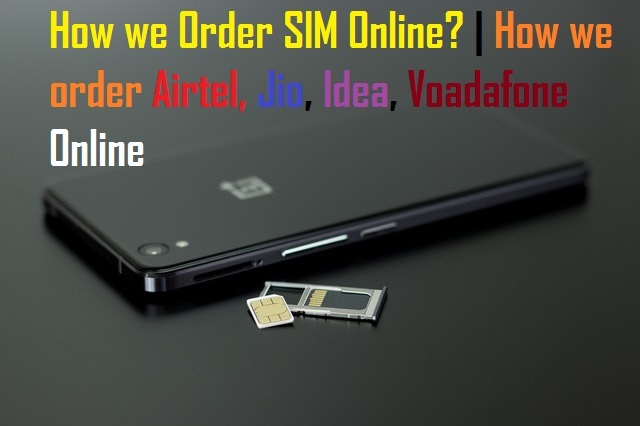 if we want to Order SIM Online then we just go to the official websites of Airtel, Jio, Idea, BSNL, Voadafone or other SIM operator Companies and after that, we just fill the forums and send this form directly to Airtel, Jio, Idea, BSNL, Voadafone or other SIM operator Companies. How we Order Airtel SIM Online? Airtel’s Online Delivery is not available in all the States of India but it may be available in future. If you want to Order SIM Online then first you just put your Pin Code and check for Availability. You will get free Airtel Sim when you will purchase it online and you will get it within 2 to 5 hours. How we Order Vodafone SIM Online? If you want to carry the Vodafone New Prepaid SIM Connection then you just go to the official Websites of Vodafone and the vodafone is easily available in all the States of India. After filling the forum online, you just go to the Vodafone Store and bring your SIM. How we Order Idea SIM Online? If you want to carry the 3G/4G Idea New Prepaid SIM Connection then you just go to the official Websites of Idea. When you registered your personal details or fill the forum after that you will get a Confirmation Call from Idea. As a result of this, you will get a New Prepaid SIM Connection of Idea. How we Order Jio SIM Online? So friends, in this article I told you How we Order SIM Online? but if you have any query about this, then put your question in comment section. I will reply to your comment as soon as possible and thanks for reading this and also share this with your friends and family. Must Follow us on your social networks.